Cultural Front: Haley Reading Group: “The Art of Saving Relics"
Haley Reading Group: “The Art of Saving Relics"
Sarah Everts's "The Art of Relics" begins by following a museum conservator who notices the decay of a prized astronaut suit made out of plastic. This inspires research on the research of the lifespan and dependency of plastic used in astronaut suits, artwork, and other materials (3). The scientists can pinpoint four specific type of plastics that are not durable and long lasting. This article follows the scientists as they search for alternatives to plastic and warn artists and others depended on plastics of the danger of its reliability. The article was selected by Hope Jahren as one of the "best" science and nature writing pieces for 2017. In brief, what do you think led her to view Everts' article as one of the best? I think that Evert’s article was viewed as one of the best because the content of the article will help reserve precious artifacts. In the ending on the reading Evert writes “Eventually all (plastic artifacts) will be past their prime, and conservators want to have the tools in hand to give these cultural icons a facelift” (9). This sentence explains the importance of this article in reserving artifacts, many artists use plastic for their art and after a while those things will start to deteriorate. This article shines light on the problem and on top of that offers a solution, because of this, I believe this article is one of the best also. In my opinion this article was viewed as the best because it covers a material that almost everyone uses everyday. Also not many people know about the chemical reactions that take place as an object made out of metal, plastic, or etc reacts with oxygen and other gases over time. I also like reading articles that educates me with the use of science. Personally, I feel the reason why this article is viewed as one of the best is because of its message. In the last paragraph, the text says,"The great hope of conservation scientists is that restoring the past will also help them prepare for the future, when today's plastic materials - such as 3D-printed objects - start entering museum collections." Comparing this to the situation of global warming, many people believe we should protect our planet for ourselves and future generations. I think the article's future applications is what led her to select the article as one of the best. Because the article is warning people that plastics aren't reliable as they were thought to be, it is helping to be proactive. Because the issue is being raised now, we can search for alternatives to plastic and also ways to prevent these plastics from deteriorating so that valued objects don't have to become lost due to deterioration. Not only is this article important when it comes to conserving values such as art and historical relics, but it also educates people on an everyday object that people tend to take for granted. I think that the reason that this is one of the best science writings of 2017 is because it shows that trying to make things better from our past can really help better our future. In this article it talks about the plastic in the space suits and how they were working to figure out why they were changing color. It was because of the plastic that was "melting" away. They were able to help make these suits better and with this new improvement it lead to great scientific discoveries (pg.3). Since plastic is such a common everyday item it shows how a little research and improvement on the past can change the future. The article in my opinion is not the best written article, but it is centered around a topic that is important in the conservationist community, especially for scientists.The article highlights the fact that scientists are still diagnosing "how a plastic artifact or artwork is degrading" and how best to stop the "decay and repair damage" (pg 7). In a world where our environment is at risk, especially our oceans, it is important that we find more eco friendly and safeguarding our environment. Hope Jahren viewed Everts' article as one of the best because of the way old things where restored and made new. "Eventually all will be past their prime, and conservators want to have the tools in hand to give these cultural icons a facelift" (9). The reason this article is one of the best science writings is because it covers a topic that we as people are very familiar with. We are all aware of the deteriorating environment and our contribution to it as well as our over abundant use of plastic. Humans need to find an alternative to plastic because eventually it “will be past” its “prime”, and we will need something more environmentally conscious to take over (9). I think that this article is one of the bests because people don’t typically think about plastic as something that needs to be conserved, as much as we think of plastic as a source that is causing pollution and harm to our oceans. I was surprised by how many items worth preserving were made out of plastic. On page 2 the author states, “Plastic is, in fact, a building block of much of our recent cultural heritage, including important designer furniture, archival film…, the world's first Lego pieces, etc.” I found how much effort it takes to identify signs of decay to preserve plastic to be really interesting. I think this article is considered to be one of the bests because it highlights something many people did not know about - plastic does not last forever. She gives the example of the test dummies, in which the chemical bonds within the plastic broke due to losing electrons from oxygen and heat (page 3). While the process can take a while, going into the science of how plastic can degrade aids individuals into taking into account whether or not they should use this material in their everyday lives. I think article was considered on of the best because of the information given throughout the article on the preservation of objects made of plastic and how they degrade/decay over time or when they come into contact with other chemicals. Most people don't think of plastic objects as objects that need to be preserved especially everyday objects such as, "... designer furniture, archival film, crash-test dummies, the world's first Lego pieces, and Bakelite jewelry..." (2). The article itself was enjoyable for me because it brings to light a problem that many of us wouldn't normally hear about or think to be an issue, to begin with. Plastic is so common because it's cheap and versatile. It's a material that many of us take for granted, and from a conservationist's point of view, it's more often seen as a nuisance or problem than a significant resource. This article made me realize that although plastic is not typically seen as valuable, art or artifacts no matter what they're made of can always have some type of value associated with them. The paradox of having to preserve plastic and the way in which the writer dispelled the myth of plastic being "invulnerable" made this an interesting read. I can see why Jahren thinks so highly of this particular article. In my opinion, this article was considered the best because it raises the awareness of the different plastics we use and how they're not making artifacts in museums deteriorate faster than what they should be. This article can help bring awareness to other museums who haven't caught on yet to help save artifacts. All of the research and experiments to help find new ways to keep and restore artifacts can be used in the future as well as applying it to everyday life for people looking to be environmentally friendly. This may be seen as a great science article because Everts does well with being informative about the types of plastic materials that can be harmful. Like the PVC, for example, is a type of plastic commonly used for incubation tubes that releases harmful toxins when it degrades (5). Information like this will be helpful for any individuals wanting to pursue careers in healthcare. I think the article's in-depth breakdown of the plastic, it's chemicals, and it's behavior is what led Jahren to view Everts's article as one of the best. Before reading the article, I had no idea that plastics were capable of such things. I think it is regarded this way because when i think about plastic, I do not think about the long lasting effects as much as I think about it is a temporary placeholder for something else like steel. I never really thought about the long lasting effects of plastic and how much of the stuff we use that is actually just plastic. Like on page 2 which describes the plastic we use that we expect to last without much of a question. It is actually a really informative article. This article was viewed as the best for a number of reasons. For one, the article was informative, bringing awareness to the unreliability of plastics. Not only did the article inform just on that, but the author went as far as to explain the impact its decay has on historically important artifacts. Everts provided information on how those plastics could be cleaned without damaging history. As humans of the present, we should arrive to protect history, not just ignore it when things get a bit challenging. I think the main reasoning behind Hope Jahren's pick for the best science and nature writing pieces would be for the relevancy of the article. Our use of plastic and our methods of disposal has long been a subject of debate. The article does a great job of shedding light on this problem, and also educates readers on what needs to be done to be better about it. The article was likely chosen as the best for it's relevancy. A "great hope of conservation scientists is that restoring the past will also help them prepare for the future". Understanding the process of deterioration can be critical knowledge to preserving artifacts from the past and those items in the present we want to keep around for awhile. After reading the article, I think Jahren picked this article because of the common concern that plastic is very harmful to our ecosystems while also being one of the most used material. One page 3, Everts quoted Shashoua, "'Nobody thought that plastic objects in their collections would degrade.'" I believe Jahren wanted to bring awareness how plastic is decomposable but it's still harmful and destructive in other ways and we should be mindful of the types of plastic we are using on a daily basis. I believe her article was selected as one of the best due to the topic discussed. Plastic is a popular material that apparently many artifacts are made of. According to the article, "Most people think plastics last forever...But although the repeating units of carbon, oxygen, hydrogen, and other elements in plastic have a long lifetime the overall chains-synthetic polymers-do not age well" (2). This shows how plastics do have an expiration date, and in order to preserve important artifacts, it's essential to diagnose plastic degradation. I believe that Evert felt this article was one of the best because it painted the picture of how the disposal of plastic has been an issue for over several decades. This is a very important topic because the effects of plastic disposal are just now becoming majorly researched. “Although researchers are getting better at disguising how plastic artifact or artwork is degrading, they are still trying to figure out how to best stop the decay and repair damage” (page 7) The more researchers become knowledgeable about the topic, the more they will be prepared for the future. I believe the article was viewed as one of the best becuase the author painted a very vivid picture while reading. As I read the article, I felt as if I was right on the set seeing everything with my very own eyes. Another reason this article could have been viewed as the best was because it brought the reader a lot of information on plastic, a material many people may not know much about. What I got out of this excerpt the most was how toxic it truly is when plastic is being illegally disposed in our areas. Most people, unfortunately, do not believe this because they cannot tangibly see the harmful effects that arise from this event, but from lots of research, we can thus conclude that the plastic that is being littered has deathly effects on not only our landfills, but also the species that reside in those areas too. I think that the article was viewed as the best because of how much detail and knowledge was written within the article. Even though much of the article was confusing to me, since I know nothing on this subject, it still explained more about plastic that I didn't know. For example, on page 4, different types of plastic that are "prone to problems" were described and they were PVC, polyurethane, cellulose acetate, and cellulose nitrate. I think that bringing knowledge and helping people understand these different strands of plastic is why this article is deemed the best because it is a huge and ongoing topic in our world today. Reading this article, was extremely eye opening. I found our dependency on plastic repulsive. It was stated, “Plastic is, in fact, a building block of much of our recent cultural heritage..". This is true, however, humans must find an alternate for of useable material. In brief, what do you think led her to view Everts' article as one of the best? What I think led her to view Everts' article as one of the best is because the author does a great job at showing and explaining all the harmful effects of plastics and how they are being used and dealt with. For example, on page 4 she tells us about 4 different plastics. PVC, Polyurethane, cellulose nitrate, and cellulose acetate. She explained the uses of these plastics, the harm that these plastics causes, and some solutions and steps we can do to improve this situation. After reading, "Researchers are also devising new strategies for freshening up precious plastic art without harming it, using everything from cleaning solutions called microemulsions to polyester microfiber that gently remove dirt." on page 2, I believe that Jahren's decision was due to Evert displaying how important this discovery can be to all of its readers. America is a country that is plentiful of artifacts from history. Even families have artifacts of their own that get passed down generations after generations. This relates the discovery to everyone. This reading shows that such a small observation such as the one made to lead to this discovery, can affect us and our history. I don't know enough articles to say it's the best, but it definitely indicates a one of the largest scale topics that are being dealt with today; plastics. I find it pretty interesting as well how the arts (and the entities that preserve them) seem to be a respectable source of scientific innovation. The shear research and precision shown to solve these unique problems is pretty impressive. In my opinion, this article was viewed as one of the best because it has a strong message behind it. "Eventually all will be past their prime, and conservators want to have the tools in hand to give the cultural icons a facelift"(9). Plastic is something we use for many things now and this researched data can help us in the future. From this research, the plastic that is being used in other museums to protect artifacts can somehow be modified or replaced with different material to preserve the life of the artifacts. I believe Evert's overall research led Hope Jahren to view her article as one of the best. Her work will extend the long term preservation of precious, sacred, and historic artifacts which will allow history to stay alive. Her article provided a solution to the problem with using plastic to preserve and this was illustrated when the text read, "Eventually all will be past their prime, and conservators want to have the tools in hand to give these cultural icons a face lift" (9). I think Sarah Everts's "The Art of Relics" is the best because typically people don’t think of plastic as something that needs to be saved, but more as something that we need to get rid of. When most people think of plastic they think of trash, pollution, and damage to our Earth. On page 2 the she states, “Plastic is, in fact, a building block of much of our recent cultural heritage, including important designer furniture, archival film…, the world's first Lego pieces, etc.” These are all small but important things to our culture that should be protected for the future and history. "Plastic is, in fact, a building block of much of our recent cultural heritage...(2)". This article is viewed as one of the bests because of it's knowledge given. Most people do not know that plastic will break down. This article was able to provide vivd detail as to what happens to plastic items over time as they break down. The article was able to draw a very descriptive image of the items of art being discussed. I think this article was chosen as one of the best because of how in depth it was. The article clearly discusses whats happening to plastic and why its happening. I also think this article was chosen as the best because it covers a topic most people don't think about. Most people look at plastic as a durable, long-lasting material, not one that breaks down over time. 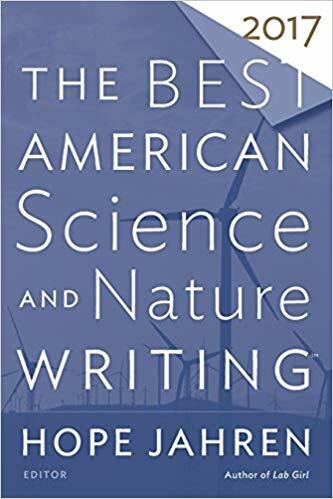 I think Everts’ article was viewed by Hope Jahren as one of the “best” science and nature writing pieces because Evert’s writing talks a lot about a very controversial material that people use frequently in their everyday lives. And it explores how these materials aren’t as reliable as we thought. This article is important because it is about value conservation of art and it explores the dangers and alternatives to which is very important. I think the reason why it’s considered the best is because it takes about a material taht is very important. Plastic si something everyone uses ona daily. It is important to know that plastic is not everlasting and can degrad. Teh article explain exactly how it happens by breaking down the entire process. By doing that you read how to in a way prevent it from degrading faster. In my opinion I’ve never heard of anyone talking about how plastic is degrading. It effects artist who are using plastics to create art. If it is not common knowledge then how can we know how to prevent the problem from happening. I think this article was chosen as one of the best because of how informational the article is on something so important to our world. A lot of people don't understand how plastic degrades over time and is not a forever lasting material. This article brought this fact to light in many different areas of our society when the text stated, "The conservation field is now racing against time, trying to keep pace with the material's [plastic] unexpectedly rapid deterioration" (Everts 2). Conservationists have to constantly try their best to preserve artifacts and tools made from plastic that are degrading more and more ever day. I think this article is viewed as one of the best due to the fact that it’s about a very essential material that is used very frequently in today’s society and the every day uses of so many things and until it’s brought to others attention, not too many people will know about that dangers that might be involved with using this material. In my personal opinion, I believe that this article was viewed to be the best because of the message that the content depicted. It covered information that most all of us use of the daily. I think it is very cool that this article not only could educate one about different chemical reactions that occur with oxygen and other gases over time, and was easy to understand because it was referring to items that I frequently come across. This is really important because our environment is at risk and it is very crucial that we are more eco friendly and promote the safekeeping of our environment . The reason why this article is viewed as one of the best in my opinion is because of its message that is being presented. In the text it says,"The great hope of conservation scientists is that restoring the past will also help them prepare for the future, when today's plastic materials - such as 3D-printed objects - start entering museum collections." In today's time we always hear about global warning and the need to protect our planet is great.Learning way to converse and preserve the earth will teach us many things. I think this article was chosen because of all the information it gives about plastic. the article talks about how plastic is a building block of our cultural heritage and how important it is to our everyday lives. Also, unlike most articles about plastic, this article also shows us how important it is to preserve plastic. A lot of the time I read things about getting rid of plastic and using less plastic, but it is also important to be able to preserve the plastic that is apart of important historical objects. I think this article was chosen as one of the best science and nature articles because of the way the author presented and explained in great detail all of the information on plastics. After reading the article, you feel so educated and informed about the four types of plastics that don't last. Overall, I feel the author is a in a way trying to help us conserve the Earth due to the fact that she attempts to inform readers of the degradation of these plastics, a topic that almost everyone knows a little something about, but yet nothing close to what Evert presented in the article. I think this article was titled one of the best science writings was because of how well it broke down information on plastic. Plastic is so useful to our way of life and now I know a lot more on the different types of it and chemicals that are in in and released when it is degraded. I am now more informed on plastic and the four types because of this article. I think this article is considered one of the best because of the useful and interesting information it had. Plastic is very popular and found in almost everything that we use. We always hear about the benefits of using plastic, and are constantly reminded to recycle it. However, no one really things about the harmful effects that it has over time. Not only did Everts make us aware of the issue by using everyday examples, such as handbags, but she also talked about the attempts to prevent the harmful processes. This article wa viewed as the best article of 2017 due to the topic it covered. It showed how we could simply use articles from our past to make something innovative. She also discussed the concept of recycling which everyone was familiar with therefore it became one of the best. This article to me is one of the best, but not the number one of best. It talks about the rising issue of the the deadly material of plastic, and the harm that it does to our planet Earth. However, people know the harm of plastic, we need to start talking more about the solution to what can be done about this growing problem. I am already educated on the different types of plastic and which ones can and cannot be recycled. I also try to educate others on it too whenever I get the chance. The author did a good job presenting with the information, it is just time to start presenting with more solutions. I think this article is viewed the best because of the interesting topic that the author chose to write about. Most people usually wouldn't view lastic as something that is important because it can be made so easily and it is cheap. She also covers stuff that today's audience can relate to. I believe that the text is referred to as one of the best because of it's topic being so important. Plastic is something that everyone uses in their everyday lives. Therefore, a further development of it could only make plenty of things in our lives much better, easier, longer-lasting, etc. This article was most likely selected as one of the best because of the innovatory work done by these scientists. The whole world, the US especially, depends on plastics for so many things. No one ever thinks these items have a shelf life, but now this research is proving different. This article shows why research and continued education is so important: we think we know everything until we choose to dive deeper, where we can find out more than we ever thought we needed to know. I am interested to see how/if this research will impact the USA’s dependence on plastics. Hope Jahren would view Everts' article as one of the best science and nature writings because of the search for a more durable plastic. This is seen as major because not only is their work helping preserve artifacts, but also the history and scientific advancements of human kind. Imagine if the astronaut suits were to completely deteriorate. We would only have photos of what they looked like in their full glory instead of the physical artifact. The plastic research also debunked the idea that most of us are fed which is that plastic cannot deteriorate. With plastic being one of our biggest parts in manufacturing goods, plastic research helps us understand how to properly make and what to make a product with. The Art of Saving Relics is one of the best American Science and Nature writings of 2017 because it tackles a subject that people are unaware of and explains possible solutions to the dilemma of plastic deterioration. The book explains how paintings created from acrylic paint are experiencing decay and that water, although it may seem a reasonable solution, poses the risk of the paint swelling. To mitigate this Everts explains how water can be modified by “keeping water’s pH levels around 6 and making the water moderately salty…” (9). This article was chosen as best because it gave us a new way to view the reliability of plastic. It described how everyday plastic is not as tough as we once thought it was. Research shows that the plastic we are using to protect our artifacts is "melting away" and we need to look into finding a replacement. I believe that this was considered one of the best by Jahren due to the nature of the piece. Using plastic has been such a hot topic in the world as of late. More and more people are starting to switch from using plastic to more sustainable resources. Sarah Everts makes a great point in her writing with a quote from Yvonne Shashoua, “We now know that objects made of plastic are some of the most vulnerable in museum and gallery collections” (Everts 2). To us, anything in museums are going to last forever because many of us did not know some of these priceless treasures are made of deteriorating plastic. I love that they began to explain about the dangers of utilizing plastic to the artists so that they were aware of what could happen. The article, I believe, is described as the best simply because of the topic surrounding plastic and how to make it less degradable for artistic purposes. An article such as this could have much push-back due to the current scientific advances in the opposite direction - making plastic more biodegradable. The characteristics that make the article by Everts, the "best" are the descriptions of the scientific concepts. Everts effectively explains how plastic is important in both the scientific world and art world by emphasizing famous works by Warhol and Hockney, where they "all used acrylic paint- a plastic polymer," on page 2. Moreover, the article allows for those who do not fully understand science and its terms, to develop an understanding to the importance of items such as plastic in the real world. Hope chose Evert’s article and considers it to be the best because it covers something that any person can encounter daily. The debate on whether plastic is reliable is long-standing and one that is discussed often. I think a new take on its reliability brings a fresh perspective on the topic. To enumerate, art is a major driving force for a large part of our society and how we track time and its different periods. The loss of these items would result be detrimental to learning about those who came before us. In this sense, it bleeds into other studies and industries as the study if human interaction is its own driving force. It showcases the domino effect it has on our society and how disciplines are interconnected. I believe it is seen as one of the best because it speaks on a subject people commonly believe they understand and clearly explains the truth. It highlights a flaw many people have, which is seeing or hearing something and believing it to be true but not thinking about it more deeply about the specifics of it. After reading Sarah’s Everts article I think the reason it was deemed as one of the best science and nature pieces is because of the picture it was able to paint along with the awareness it’s spreading. I was able to step into several different scenes and feel the impact of plastic degrading. Along with how she breaks down the science behind a problem that currently there are no solutions for, on page 7 and 8 she says “Cleaning may make the object look better, but it might eventually accelerate the overall demise.” If plastics can be cleaned to make look better but still decompose that means a lot of fixtures throughout time are going to be affected. I think Jahren viewed Everts’ article as one of the best science and nature writing pieces of 2017 because Everts wrote about a topic that is important and concerns our environment. We consume so much plastic in our daily lives but never really think of the longevity of plastic. Many people hear plastic and think of how bad it is for the environment but we don’t consider how there may be times when we should actually preserve plastic (such as for art). Overall though, we need to find better alternatives to plastic. I think that it was viewed as one of the best because it brought an issue into light that may not have been had not someone started talking about it. “Plastic is, in fact, a building block of much of our recent cultural heritage," (p. 2) which we can forget sometimes. We don't always think about how important a material is in our everyday life until its gone so we need to be working to find new ways to make what we use everyday have a longer lifespan. I definitely feel like this was viewed by Jahren as one of the best articles of 2017 because it's such a relevant and timely issue. At first glance, it might not seem like it - astronaut gear degrading seems very niche. However, Evert was touching on a very real issue, as humanity relies very heavily on plastic for a majority of day to day objects. On page 3, Evert has a quote from Shashoua saying, "Nobody thought plastic objects in their collections would degrade." and that's the truth. It's bringing light to something that will have a worldwide effect, and I think I agree with Jahren that it makes it one of the best articles of 2017.